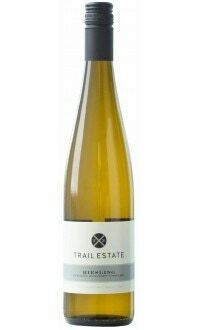 Sorry, Trail Estate Winery does not ship wine to United States. Boasting a nose of flakey and buttery pie crust topped with field fresh apricots and a dusting of vanilla and nutmeg. This is a full bodied and seductive Chardonnay. A combination of new and older French oak yield a rich and layered palate with just enough acidity to keep it lively. The wine aged on its own lees for 10 months, finishing malolactic fermentation in tank. A minimal amount of sulphur was added at the end of October and the wine was bottled unfiltered in November 2016. "A stunning cool-climate Chardonnay with aromas of toasted almond and green apple. Racy acidity makes this perfect for roast chicken. Medium-bodied."